Killer Characters: GIVEAWAYS! One for you and one for your library! GIVEAWAYS! One for you and one for your library! Hi, my name is Sally Caldera, Head Librarian of the Beachside Community Library in Fort Myers Beach, Florida. I can’t tell you how lucky we are to have a fabulous café that also functions as a book store right here in town. The owners, Sassy Cabot and Bridgy Mayfield, decorate their tables with author related memorabilia and name their menu items after books and authors. (I love, love, love The Secret Garden salad, with a creamy pecan dressing.) And they have book club meetings! Naturally we all became great friends as soon as the Read ’Em and Eat opened. Just last week, April 8-14, we all celebrated National Library Week. The library sponsored a number of fun events, including author readings, arts and crafts, and yoga lessons. When we celebrated National Library Worker’s Day, Sassy and Bridgy were kind enough to donate dozens of Miss Marple Scones for our festivities. Our library offers all kinds of wonderful materials to the public, but I am especially proud of our collection of Large Print Books. So many of our patrons are more comfortable reading large print books, we are lucky to be able to give them a terrific selection. 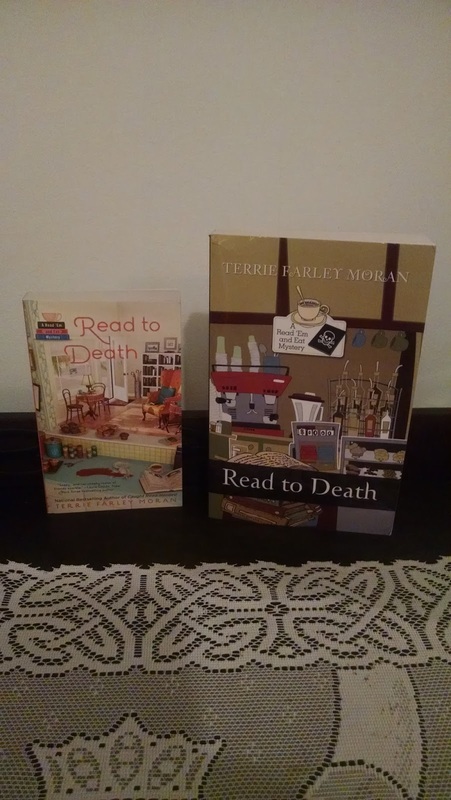 To celebrate libraries our author is offering you a chance to win two copies of Read to Death, a mass market paper back copy for you to keep and a large print copy for your local library. To enter for a chance to win please comment below and tell us anything at all about large print books. You love to read them, you hate to, your mom reads them, you have never seen one—we want to know. Please include your email in this format: yourname (at) your server (dot) com—so the spambots can’t pick it up. Comments close at midnight, your time, on Saturday, April 21st. I like large print. They are easy to read and each page goes fast. My mother could read them as she had problems seeing. I love large print books! My library has a large selection of them, especially mysteries! Thank you for the chance to win these books. After this week's visit to the eye doctor I think there are more large type books in my future. My library is the place where my once read or not interested in reading books are happily accepted and put into circulation for others to enjoy. I'd love to be able to give them a large print copy of "Read to Death". Sounds like a wonderful giveaway! I love this series. bobwiesmann (at) gmail (dot) com. Even though we are fortunate to get some large print books via a grant from a local org, there are never enough as at least a quarter of our patrons are residents of the senior community in town. few books, whether large print or small. Large print is wonderful when the lighting is't good. Living in south Florida, there are plenty of library users who want large print books. I have a couple of large print books and they are really easy to read. I think libraries should have a collection of large print books. I have recently learned to love large print due to having to go into the eye specialist quite often. After intense dilation and testing, my eyes cannot see up close for the rest of the day. Enter large print books! I always have one from my wonderful local library before each appointment so I don't have to miss my favorite activity that evening. on the eyes. Thanks for the chance to win. I personally am not a fan of large print but our patrons just love them so they definitely fill a need. So great for those that need it but not for me...yet. I don't feel like I need the larger print yet, but love that it's available. I read large print books and then I pass them on to my mom who has very poor eye sight. I like large print.I used to go to the Library in my twenties...and if I wanted to read the book and it was that...fine with me...now I like it even better. I would love to read in this series. Thank you. The older I get and the more my eyes seem to have trouble adjusting to the smaller print even with bifocals, I appreciate the larger print books more and more. With a large print book, I can just concentrate on reading and enjoying the book and not trying to get the book held just right in a brighter light to see it which distracts from the story itself. I can still read regular books but if the two were side by side I would definitely pick up the larger print one first. Thank you for your generosity and not only being able to win a copy for myself but also for our local small town library. We are a small town with a population of less than 3000. That being the case, most times after I have gently read the books I get, I usually give them to the library for others to enjoy as well. Might as well pass on the joy of reading to others. As I get older, I find them easier to read. I would love to win a copy for my local library. Thanks for a chance to win. I like reading large print. Sometimes I can go without my glasses. Also our library, which just celebrated it's 200th annimversary, oldest library in Indiana, has a large, large print collection. They also have a outreach program to get books to those who cannot get out. They use large print and audible a lot for those. I like larger print books. Although with my reading glasses, I can read without an issue...I find some of the trade paperbacks have really small print ...I would imagine to save money on printing costs. If I buy a hard copy of a book, I will always check the ease of reading the print as far as possible eye strain goes! I(Idon’t like headaches)... if there is a larger print copy available...I’ll take it. Online is not an issue because you can adjust font size as needed. I use Large print books from the library. An added bonus is that there is a shorter wait list. I like to read large print books as when I get home at night, my eyes are tired. If it weren't for large print books, I couldn't read as much as do. Besides that the readers are working, but I am sure it won't be long for the prescription glasses. Thanks for the chance to win your giveaway. Love large print books much easier to read. large print reads the same as regular print. the book maybe a little bigger that's ok. When I was awaiting cataract surgery, I started looking for large print books at my local library and found quite a few cozies in large print. Now, I can see better, but still hooked on large print because it is so much easier to read. Giveaway is closed, winner has been notified and thanks to everyone who participated. Yay libraries!! Winner is Neena Luciow. Congratulations to Neena and to the Wainwright Public Library!